Posted by gordonwatts in CERN, Office Space. You can probably tell a lot about an organization by the doors on the offices. 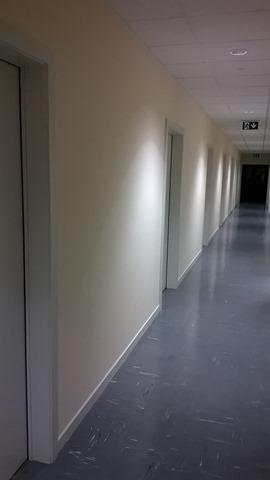 Walking down its hallways, do the occupied offices have their doors open or closed? I have no idea what it means about the workplace! The reason I’m writing about this is because I noticed how many people keep their doors closed here at CERN! Part of the UW group just moved to a new building, B26, and the hallway is mostly empty as people have yet to move in. But then I realized that about half the closed doors have people in the offices, working. When I’m at UW I always have my office door open. The only times it gets closed are when I’m not there, when I need a 5 minute nap, or once in a great while when I need to be isolated in order to get some tricky and time sensitive work done. Frankly, when I close my office door, feel like I have shut out everyone around me. I’ve turned my office into my home office. No one from work ever comes by (well, ok, except for my wife). I am never bothered. I never interact. Interaction is one of the key points about work: bouncing ideas off each other, some quick discussion of the next steps for a paper with a student, etc. Walking by an office and remembering you need to need to discuss something with them. And in person discussion is much more efficient than email for any subject with some complexity. Besides teaching, this is the reason I go to the University to work, rather than just stay home all the time. And here at CERN – this is particle physics. Perhaps one of the most social sub-fields of physics. We have to work in groups – we have to interact. I get it – there are individuals who would get no peace if their door was not closed. But, frankly, there are not many people like that. Well, if your office is next to the 4th floor conference room in 40C, you keep the office door shut so you can hear yourself think. All and sundry seem to think the corridor outside is a (dreadfully echoing) meeting room, or a place to hold loud mobile phone calls. Sometimes, you feel the need to think! On the other hand, when in the University, keeping your office door open is recommended policy when talking to students at least. An introvert needs the door to be closed sometimes. Ah, definitely. The external noise is a big problem! As far as being an introvert, I agree. Though I have to say I am rarely bothered with my door open!